Product code: ES3402 Categories: Sold Items, Sold Rings. 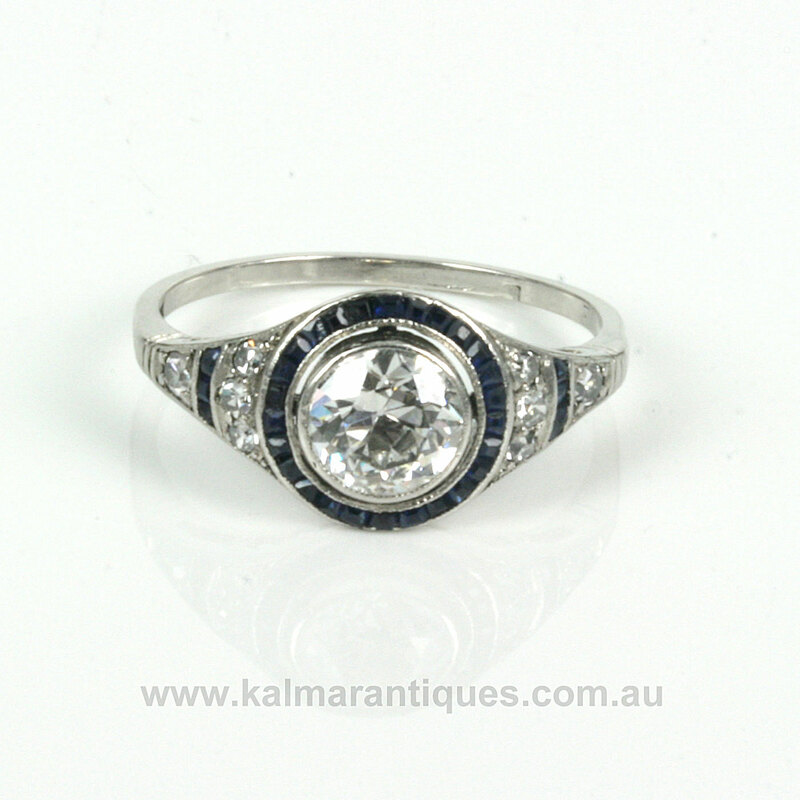 Art Deco jewellery dating from the 1920’s to the 1940’s produced some truly spectacular designs and here is a magnificent Art Deco diamond engagement ring set with sapphires. 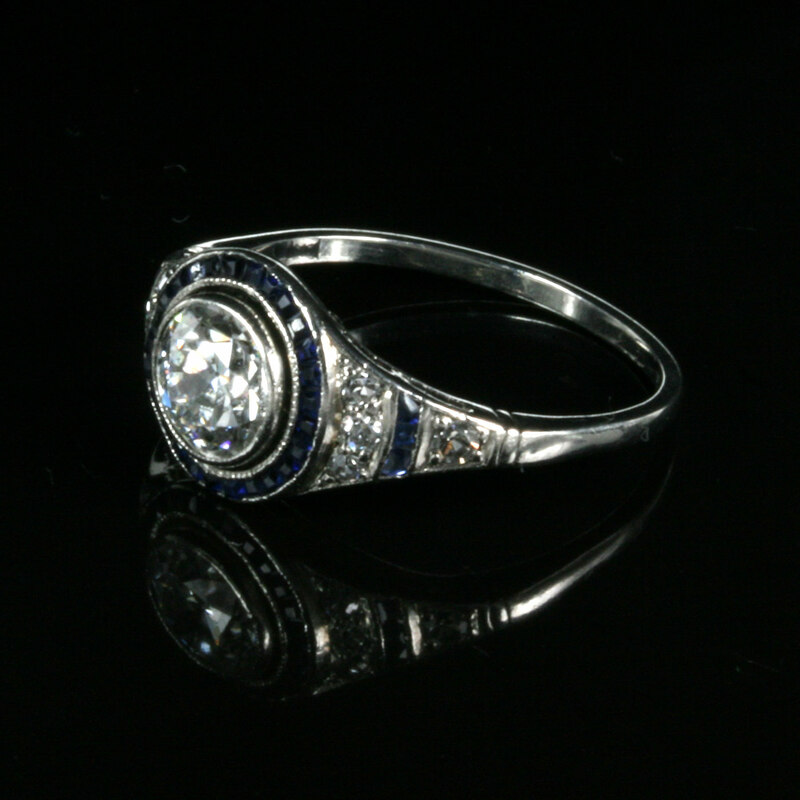 Entirely hand made in the 1920’s, this ring was made in platinum which was the preferred metal during this period. Platinum has the wonderful advantage of being a pure white and has the ability to be drawn into a very fine wire while all the time retaining its strength. The design of this ring has all the characteristics and style that makes genuine Art Deco rings so desirable and this ring would make a fantastic example of an Art Deco engagement ring that will always be admired and commented on. Set in the centre with a 1.30 carat diamond, the diamond is surrounded by 26 blue sapphires that really stand out against the platinum and highlight the diamond even more. Then down each side are 3 more diamonds and a further row of sapphires with one more diamond to finish it off. The sapphires total 0.32carats and the extra diamonds 0.14 carats. At the centre, the ring measures 10.2mm wide and from one side diamond to the other it measures 18.85mm across. The design of this Art Deco ring is just spectacular and would make the most perfect Art Deco engagement ring to wear all the time with so much pride and enjoyment.